Marion County Early Chidhood Task Force will be having the 14th Annual Big Truck Night on from 6-7:30 p.m. on Thursday, Sept 13. It will be held at the Hillsboro Elementary School. In addition to lots of big trucks of all types, the event will have activities geared towards children birth to five years old. There will be sensory activities, a tricycle riding course, games, toy trucks, free refreshments and more. Contact 620-947-4041 for any questions or more information. The Goessel Library will have Preschool Storytime at 10:30 a.m. on Fridays. Join them for stories, crafts and other activities related to different themes each week. These will run from Sept. 14 to April 26. If USD 411 does not have school due to weather or holidays, there will be no story time. Hillsboro Public Library plans to begin sign-up for Fall StoryTime on September 1. StoryTime includes stories, crafts, music and games for children 3 years old (by Sept. 1) to preschool, for a one-time $4 fee. Parents may come to the library to sign up for either the Wednesday 10:20 am or Thursday 10:20 am session. Beginning September 19 and 20, the 40 minute sessions take place at the library in the Hillsboro City building. New water mains and services will soon be constructed in the east side of Hillsboro. An informational meeting for homeowners living in this area will be held at 7:00 p.m., September 18th, at Hillsboro City Hall. Personnel will be on hand to describe the construction project and answer your questions. The public is invited to attend the meeting. The Hillsboro High School band will be having a fundraiser from 10 a.m. to 5 p.m. on Saturday, Sept. 22 at 400 E. Grand Ave. in Hillsboro. The one day mattress sale will feature over 20 brand name floor models on display for customers to try. All beds purchased are brand, made to order and have factory warranties. The prices are lower than retail stores and layaway is available. 2nd Saturday 2 Serve will be working on the Schaeffler House grounds 8-11 a.m. on Satuday, Oct. 13. This is a new date as the Sept date was cancelled due to weather. Anyone is welcome to come and help! Please bring your whole family and your own yard tools. We will be serving from 8-11. We are looking for period appropriate perennials and shrubs to plant. If you have peonies or other plants you would be willing to donate, please contact Steve Fast at Hillsboro Museums, 620-947-3775, or Krista Heinrichs, 620-877-0638. Shop locally and get your plants from Serenity Gardens where Jana can help you choose the best plants for this project. 2S2S is a community group that is doing service projects the 2nd Saturday morning of each month. If you know of needs in the community or would like to join us, you can find us on Facebook or contact Krista. Take a moment and save a life. 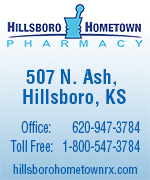 Gift of Life Marrow Registry will be in Hillsboro on from 11 a.m.- 2 p.m. on Saturday, Sept. 22 for a bone marrow drive. The event will be held at the State Farm building at 114 N. Main. Refreshments will be provided. All it takes is a fast and easy mouth swab. Donations for Corey Burton and Gift of Life will be accepted at that time or any time up until the event. For questions or alternate collection times, please call 620-947-5900. The family of Roger Ryder, 12-year resident of Hillsboro, is again asking for help from the community. Roger has been diagnosed with Stage 3 pancreatic cancer. He is currently undergoing chemotherapy. Because of his illness, Roger is unable to work and the family has many financial needs at this time. 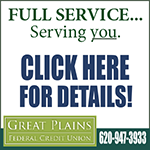 There is a benefit fund set up at Great Plains Fed Credit Union if you would like to donate directly there. To find out how to help, call Roger at 620-877-0376. Donations can be dropped off or mailed to the family at their NEW address of 407 S. Cedar. Anything will help. The Mud Creek chapter of the Kansas Anthropological Association (KAA) will host the annual Artifact Identification Workshop from 10 a.m. – 2 p.m. on Saturday, Sept. 22, in the city of Marion. The event will take place in the Santa Fe Room of the Marion City Library, 101 Library St., one block south of the courthouse. Interested persons from the central Kansas area may drop by the library and speak with professional archeologists. Well-experienced amateur archeologists from the KAA will also be available. Collectors can bring Native American artifacts or early historic period items throughout the event for assistance in identification and dating. Helpful suggestions will also be made for cataloging and collection maintenance. No appraisals or sales will be made. This is a free public service to improve knowledge of our state’s archeological heritage. Visitors may-come and go,as is convenient for them. Light refreshments will be served.